Some years ago Dutch architect Rem Koolhaas raised a critical voice about the architectural heritage culture, suggesting that too much preservation would stall the natural evolution of cities. That was before last year’s Venice Architecture Biennale, when criticism towards historical sites was a typical Koolhaas provocation, which made sense when thinking about his practice and their grand aspirations at the time. However, Koolhaas’ change of heart was already evident at the Biennale. His latest project for the Prada fashion empire has been all about renovation – and what a renovation it is. 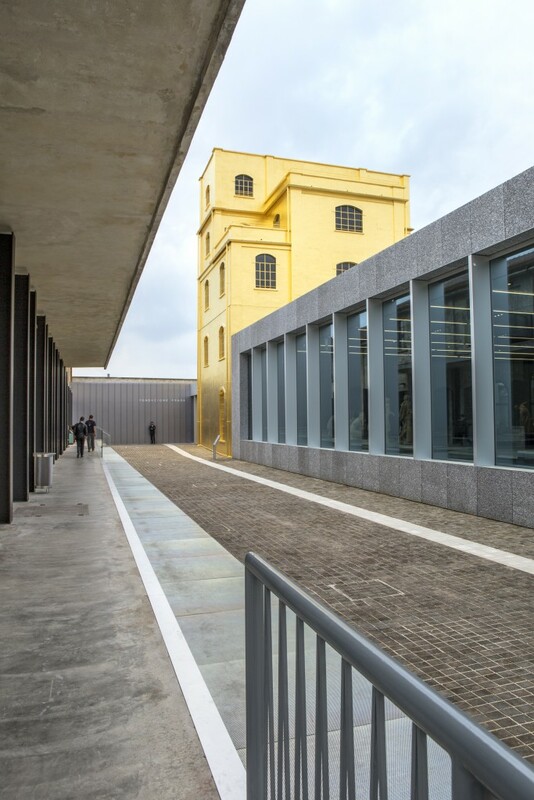 A vast gallery created from a historic industrial building for the Prada arts foundation in Milan, it’s a collaboration where the client and architect have thought meticulously about each detail and material: from the tower covered in gold leaf to the way the statues are displayed. Koolhaas had already designed stores for Prada; the arts space marks a culmination in a shared stylistic vision, while looking beyond the ‘white cube’ gallery model. Elsewhere the galleries continue through the vast former warehouse building, showing art from the 1970’s onwards, including contemporary stars such as Damien Hirst and Jeff Koons, as well as a series of installations made of cars by Elmgreen & Dragset, Carsten Höller and Sarah Lucas. In these imposing rooms the white, neutral gallery walls are replaced by grey concrete surfaces providing a warmer, more tactile environment for the art. The cafe by the entrance, designed by American film director Wes Anderson, has an outdoor terrace. It is a great stopover when visiting the large galleries in this former industrial neighbourhood of Milan. The cafe interior is the antidote to the minimalist bar or restaurant usually found in museums. This cinematic space, decorated with a retro Pradaesque colour palette of cool pastels, is an element of surprise. Within the strong visual storytelling that underpins the fashion brand, there is always space for playfulness. With her husband Patrizio Bertelli, Miuccia Prada continues a trajectory of taste, lending high end fashion culture an intellectual edge. Koolhaas has created a space to house their personal art collection as well as an array of changing exhibitions and activities, which reflect the aesthetic values of understated, elegant luxury of the brand.